Munchkin Starfinder Closes on Thursday! The Kickstarter for Munchkin Starfinder closes on Thursday. If you’re just hearing about it now, that’s okay. 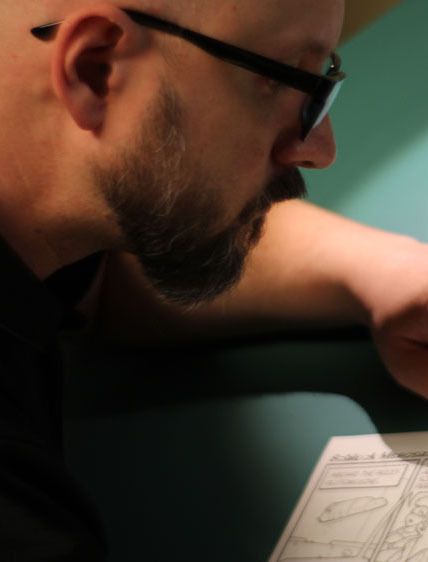 The project was on an accelerated schedule, and the Kickstarter is only ten days long. As of this writing we have two of those days left. Along with the usual stretch goals, there are some social media goals associated with this project¹. If just 27 more people become Munchkin Starfinder fans² on BoardGameGeek.com, a Kickstarter-exclusive card will be added to the “I Want It All” box. With a few more Facebook shares³ there will be a digital Christmas card, suitable for at-home printing, shared in an upcoming backers-only update. This means that if you’ve already backed the project, Facebook and BoardGameGeek are places where you can increase your loot without spending more money. If you haven’t backed the project yet, consider this your penultimate notice (at least from me.) I’ll post again Thursday morning, and I think there will be a nice essay from me about the technical aspects of creating a new art style for a Munchkin deck. ¹ I’d never seen social media stretch goals before, but I totally get why they’re there. It’s a cool concept. The Kickstarter for Munchkin Starfinder is Live! The Munchkin Starfinder project launched Monday afternoon over at Kickstarter, and has already funded and blown past the first two stretch goals. I illustrated the cover and the cards, and aside from the fact that it was huge fun, I am psyched have gotten to contribute to the Munchkin product line¹. This project is on a very short timeline. It closes in just ten days, on November 2nd. I’m confident that Steve Jackson Games will be printing enough of these that you won’t be required to participate in the Kickstarter to someday buy them, but Munchkin Starfinder will ship to backers before it shows up in stores. ¹ The full product line is large. Fortunately, you don’t have to buy all of it to enjoy it. 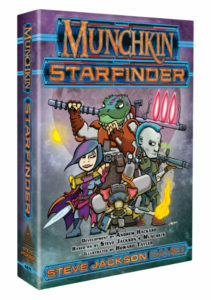 In fact, if you’ve never played before you can absolutely make Munchkin Starfinder your very first Munchkin set.